Today is Loving Day, an annual celebration held on June 12 each year, marking the anniversary of the 1967 United States Supreme Court ruling "Loving v. Virginia" that struck down all anti-miscegenation laws remaining in sixteen U.S. states. Citing "there can be no doubt that restricting the freedom to marry solely because of racial classifications violates the central meaning of the equal protection clause," the ruling invalidated U.S. state laws banning interracial marriage, mainly forbidding marriage between non-whites and whites. 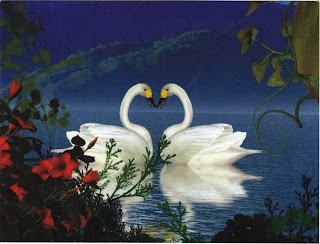 Postcard US-3284982 to Russia features a pair of beautiful swans forming a heart shape with red flowers. It was purchased at Zazzle.